Bapu Surat Singh Khalsa an 82 year old Sikh human rights peaceful activist who was resident in the US (but not a citizen) has been on hunger strike at his home village in Hassanpur, Dist Ludhiana, Punjab India since 16 January 2015 (197 days on 30.7.15 and keep adding the days accordingly to dates), calling for the release of Sikh Political Prisoners who have been unlawfully detained in prison beyond their minimum terms. One of these prisoners is Prof Davinderpal Singh Bhullar, whose conviction raised concerns by human rights groups, and who two years ago was in immediate danger of being hanged. Amnesty International has campaigned on behalf of Prof Bhullar previously. Most of these prisoners were convicted under the Terrorist and Disruptive Activities Act (TADA) in 1985-95 (https://en.wikipedia.org/wiki/Terrorist_and_Disruptive_Activities_%28Prevention%29_Act). This act was criticized at the time by human rights groups and has since been withdrawn. Many Sikhs were convicted on false charges under TADA. Many have now served their minimum sentences, but unfortunately, they continue to languish in jails with human rights violated. Amongst the prisoners are 85 year old Harbhajan Maan and 70 year old Mann Singh. Other Indians have been given parole and released, but because these are Sikh prisoners their cases are being treated differently. Bapu Surat Singh Khalsa has said all prisoners regardless of religion should be released after serving their minimum sentences, but particularly due to the historical situation is calling for these Sikhs to be released. The human rights group PUCL India has helped to identify prisoners who would be suitable for release, but the Punjab and Indian Government refuse to look into the matter. It has transpired that after contacting to a PUCL lawyer is that release cannot happen until the Supreme Court vacates its stay. The Supreme Court has stayed the release of all life convicts across India pending adjudication of the matter by five judge bench- at present the Punjab or any government cannot release prisoners who have been sentenced to life- which includes most of the political prisoners from Punjab. BUT they can be granted temporary parole immediately or they can be pardoned and convicts in non Punjab jails can be transferred to jails close to their homes. Parole is allowed as per the Punjab state legislation (or the concerned state act where the prisoners are). Pardon is granted by the Governor or the President. Whilst on hunger strike Bapu Surat Singh Khalsa has been arrested on three occasions, and has been force fed via a naso-gastric tube on two occasions. His son, a US citizen who went to India to look after his ailing father was arrested for three months on trumped up charges and tortured in prison, because he was told by police to convince his father to stop the hunger strike, and he refused to do so. He was only released after the US Government intervened. A journalist who was reporting on the matter was also arrested by Punjab police but released within a week. Peaceful protest marches were planned in Punjab to support Bapu Surat Singh’s campaign on Sunday 19th July, but the organizers were arrested by police. Then yesterday police entered the home of Bapu Surat Singh, lathi charged the visitors, friends and family who were with him and arrested them, including UK based media who were reporting on this. Bapu Surat Singh Khalsa has been arrested and taken to hospital. Due to the unprovoked attacks and arrests made by police Bapu Surat Singh Khalsa is now refusing water. Doctors are forcibly putting in intravenous drips which he pulls out. His human rights and those of others have been grossly violated. WHY ARE SIKHS BEING STOPPED FROM MEETING BAPU SURAT SINGH JI? 31 July 2015 – Sikh Parcharaks and Panthic Jathebandia are not being permitted to meet Bapu Surat Singh Ji, who is currently being forcefully kept at the DMC Hospital in Ludhiana. 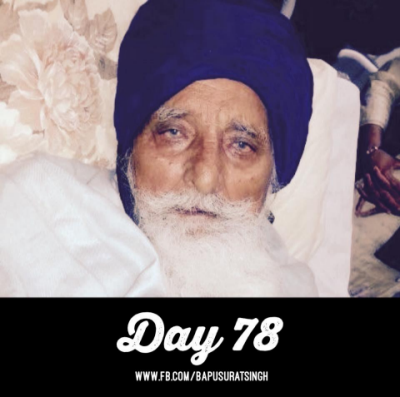 Bapu Ji has been on hunger strike for the last 197 days. Today the authorities prohibited Panthic Parcharak Baba Ranjit Singh Khalsa Dhadrianwale from meeting with Bapu Ji. Baba Ranjit Singh Khalsa and the Parmeshar Dwar Jatha have been active and vocal supporters of Bapu Ji’s campaign to free Sikh political prisoners languishing in Indian jails without reason. Baba Ranjit Singh Khalsa said Sikhs feel as if they are outsiders whilst living in India, where it seems the law is different for the minority communities. They said the Jathedars and leaders who claim to be the voice of the Panth should become actively involved and take a responsible lead role in this people’s campaign. Why are these leaders quiet? Despite numerous peaceful requests, the Police did not allow the Parcharak to enter DMC Hospital, claiming the instructions had come from the higher authorities. Many others attempting to visit Bapu Surat Singh Ji at the DMC Hospital recently have also been barred from entering. The whole world knows about hunger strike by Bapu Surat Singh who clearly sends the serene message for the release of the Sikh prisoners. Time for action and peace!!! This has to be acted upon immediately to inform that his sacrifice is respected. SGPC member and Akali Dal (Panch Pardhani) leader S. Kulbir Singh Barapind highly appreciated the commitment and dedication of Bapu Surat Singh Khalsa towards the Panth and Bapu Ji has exhibited the values to execute a peaceful struggle against state atrocities on the Sikhs. Pressure is amounting in every direction for the release of the prisoners and the relevant bodies to finally put an end to the hunger strike to peace and solidarity to the community irrespective of creed and faith.